Summer is a great time to get started on a new and healthy lifestyle. There’s plenty of sunshine and beautiful days to get out and exercise, and eating healthy will be easier than ever with this 21 Day Fix Summer Meal Plan. How do I get started the with the 21 Day Fix? If you are not familiar with the 21 Day Fix, you’ve come to the right place. This epic toolkit will get you going, and before you know it you’ll be a portion control wizard. The 21 Day Fix Summer Meal Plan below will give you an entire week of snacks, desserts, and meals. No muss, no fuss, you can just meal prep and go! I have to admit there are times when I want to be a bit lazy with my meal prep and this simple week of meals is perfect. Everything is all ready to go, putting together an interesting and healthy 7 day meal plan can be tricky. I like coming back to this one when I get stuck for ideas. 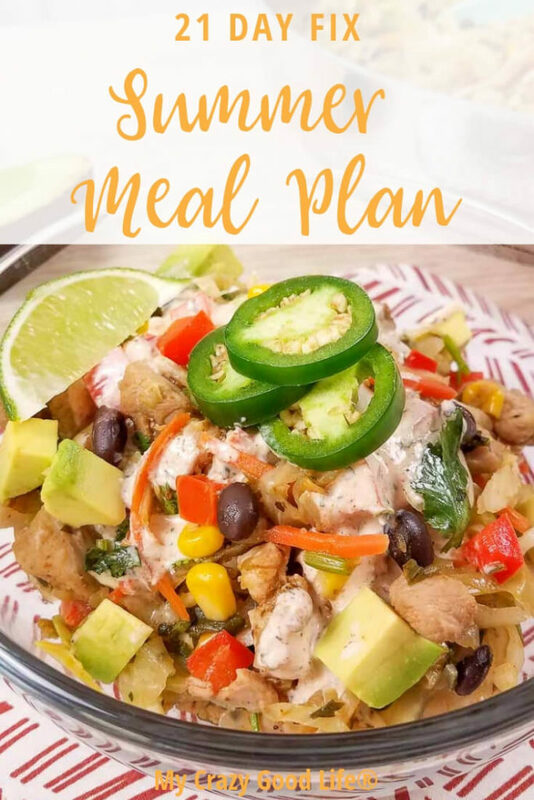 The fresh flavors and simple layout of this 21 Day Fix Summer Meal Plan make it perfect for those long days and busy nights. Here’s how it works–you choose your meals from the plan. I’d expect to eat leftovers for lunch and possibly dinner so don’t plan on making ALL of the food. Pick and choose what works for you. If you can find one recipe that you can eat all week long, that’s even better! Breakfast: Apple Cinnamon Baked Oatmeal | My Crazy Good Life This baked oatmeal is tasty and you can make one pan for the entire week! Everyone will love it so it’s also a great idea to make for the whole family. I’ll still add some breakfast recipes below, but skip them if you choose to eat this all week! If you have an Instant Pot, you’ll definitely want to try this version! Lunch: Mini Zucchini Pizzas | Confessions of A Fit Foodie These little zucchini pizzas are fun and tasty. They are another great family option that everyone will love. Dinner: Cauliflower Taco Bowls | My Crazy Good Life Looking for a low carb option for the 21 Day Fix? This one is delicious and even better when using fresh vegetables from the farmers markets. Snack: Apple Cookie Snacks | My Crazy Good Life These tasty apple ring cookies will fill you up and hold you over until your next meal. Dessert: Double Chocolate Peanut Butter Shake | Carrie Elle Kick that sweets craving to the curb with this 21 Day Fix friendly shake. Breakfast: Coconut Overnight Oats | Carrie Elle Breakfast is all about the easy options. You can prep these ahead of time for a grab and go breakfast. Lunch: 21 Day Fix Tacos | My Crazy Good Life It’s Taco Tuesday! Enjoy some lunch Tacos to celebrate. Dinner: Southwest Chicken Skewers | Confessions of a Fit Foodie These southwest chicken skewers are just as much fun as tacos and the whole family will love them. Snack: Spinach and Artichoke Dip | The Foodie and the Fix A healthier 21 Day Fix approved version served with bell peppers and crispy chips. Desserts: Lemon Ricotta Pancakes | Carrie Elle These delicious lemon ricotta pancakes can work for breakfast but they’re also tasty for dessert! Snack: Cloud Bread | My Crazy Good Life Because at some point a bread craving is going to strike hard! Breakfast: Cheesy Spinach, Ham and Egg Cups | The Foodie and the Fix You can make these ahead of time and freeze them! Lunch: Chicken Gyro Bowls with Homemade Tzatziki | My Crazy Good Life Another great make ahead option to keep your week running smoothly! Bonus, they’re so family friendly you might find yourself making these all the time. Dinner: Taco Pizza | Confessions of a Fit Foodie You can still enjoy pizza night without straying from your plan! Snack: Fixate Gluten Free Chocolate Chip Cookies | Confessions of a Fit Foodie What is more awesome for a snack than cookies!?! Dessert: Healthy Chocolate Peanut Butter Cup Fudge | Confessions of a Fit Foodie This is also gluten free and dairy free! Breakfast: Freezer Steel Cut Oats | The Foodie and the Fix Who loves make ahead recipes as much as I do?!? Dinner: Italian Pork Chops | Confessions of a Fit Foodie It’s definitely time to break out the grill, we love making pork chops on the grill! Dessert: Banana Oatmeal Chocolate Cookies | My Crazy Good Life More cookies? You’re not dreaming! Breakfast: 21 Day Fix French Toast | My Crazy Good Life This is a delicious french toast recipe that the whole family can enjoy with you! Looking for a no carb option? Try these Banana Pancakes. Dinner: Carne Asada Tostadas | My Crazy Good Life These are my favorite for cooking out! They’re super easy to make and go great on the patio! Dessert: Cocoa Banana Oat Bars | The Foodie and the Fix These delicious bars will kick your sweets cravings! Lunch: Make-Ahead Simple Cobb Salad | Carrie Elle Meal prepping at its finest! Dinner: Southwest Egg Roll in a Bowl | My Crazy Good Life This fresh and easy recipe is so delicious, it comes together quickly and makes for an excellent weeknight dinner. Snack: Turkey Cucumber Dijon Roll Ups | The Garlic Diaries There are a few other great snack ideas over there too! Dessert: Lava Cakes | My Crazy Good Life When the craving for chocolate strikes this recipe will take care of it! Breakfast: Fajita Breakfast Casserole | My Crazy Good Life Start the day off with a healthy meal that is super easy to make. Lunch: Spicy Tuna Quesadilla | The Foodie and the Fix Does anyone else love to spice things up once in awhile? Dinner: Instant Pot Dinners | My Crazy Good Life Any of these 21 Day Fix Friendly Instant Pot dinner recipes will make your Sunday night quick and easy. Dessert: Clean Eating Pumpkin Pie | Carrie Elle Say what? Pie? Definitely! This is amazing! I was completely drawn in by the “summer” part. Excited to try some of these and as always, I love finding a meal plan where someone else has done all the thinking and figuring, so thank you so much for sharing your hard work! I love this meal plan! Question: do you have a weekly shopping list? Perhaps it’s here and I’m missing it? Same here! Is there a shopping list somewhere? I’m excited too!! did she give you a shopping list???? What calorie level is this meal plan for?